Hydrohalite is a mineral that occurs in saturated halite brines at cold temperatures (−5 °C). It was first described in 1847 in Salzburg, Austria. 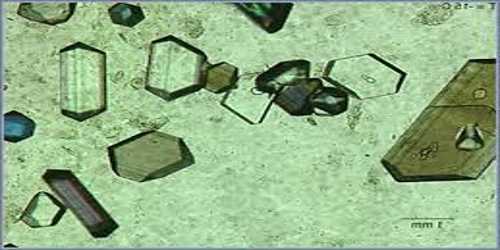 It is a monoclinic-prismatic mineral containing chlorine, hydrogen, oxygen, and sodium. It forms only under very unique conditions where the water does not dissolve the salt. Hydrohalite has a high nucleation energy, and solutions will normally need to be supercooled for crystals to form. It is a mineral NaCl.2H2O consisting of a hydrated chloride of sodium formed only from the salty water below the freezing temperature of pure water. Under pressure, hydrohalite is stable between 7,900 and 11,600 atmospheres pressure. The melting point increases at the rate of 0.007°K per atmosphere. The maximum melting temperatures are at 25.8°C under 9400 atmospheres. Above this pressure the melting point reduces. Hydrohalite has a strong positive temperature coefficient of solubility, unlike halite. 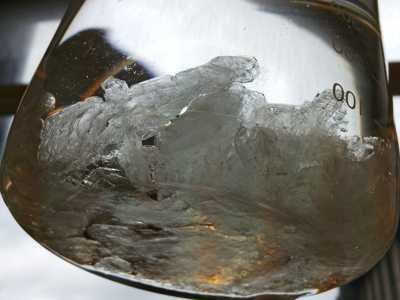 Hydrohalite melts at 0.1°C. This is an incongruent melting point, as a liquid salt water, of different composition and solid halite, is formed on melting. Occurrence: Formed from seawater or in bottom sediments of hypersaline lakes at near-freezing temperatures.